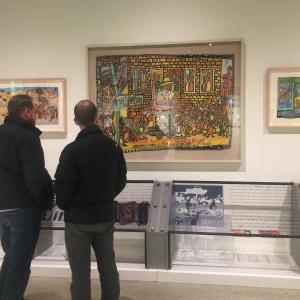 It’s a big year for African American artists in Columbus as the city celebrates with a yearlong collaboration around the 100th anniversary of the Harlem Renaissance, an artistic explosion of African American artists that began in New York and spread throughout the country. 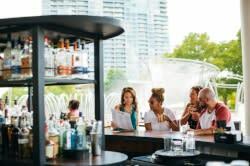 Most of Columbus’ Harlem Renaissance events take place in the second half of 2018, but there’s no need to wait see some of the great work of African American artists past and present in Columbus. Delve into the African American experience in Columbus through the artwork of MacArthur Genius Grant winner Aminah Robinson. Robinson believed in the African concept of Sankofa, understanding the past in order to go forward, and spent much of her life creating art inspired by and memorializing an area of Columbus’ near east side known as the Blackberry Patch, which later became Poindexter Village, the country’s first public housing project. 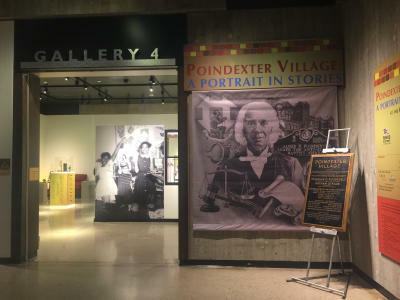 Ohio History Center’s current exhibition Poindexter Village: A Portrait in Stories details the stories and history behind this close-knit community and includes several pieces by Robinson. Community members often left buttons, ties, and fabric on Robinson’s doorstep for her to incorporate into her art. Much of Aminah Robinson’s art can be found in downtown Columbus at Columbus Museum of Art. Look for her work in the distinctly CMA gallery, which includes a rotating selection of her art. The Museum recently published a children’s book about Aminah Robinson. Don’t miss William Hawkins: An Imaginative Geography on view at Columbus Museum of Art through May 20, 2018. The exhibition is practically a love letter to self-taught artist Hawkins’ adopted hometown of Columbus, and features art inspired by local landmarks and buildings past and present from Ohio Stadium to Union Station to a life-size sculpture of the Riffe Center. Take time on your museum visit to check out the work of folk artist Elijah Pierce, who was called the most influential woodcarver of the 20th century by the founding director of the American Folk Art Museum. Pierce, also a barber, moved to Columbus in the 1920s as part of the Great Migration and later opened a barbershop and art gallery on Columbus’ near east side. His work took inspiration from the Bible, pop culture, politics, and black history, and his shop became a salon and gathering spot for Columbus black artists including Aminah Robinson, who considered him a mentor. Robinson herself was a mentor to many Columbus artists including Bryan Moss, who first met Robinson while working at Columbus Museum of Art. Now Moss is paying it forward mentoring young Columbus artists in art classes at Columbus College of Art and Design, Columbus Museum of Art, and the Wexner Center for the Arts. Moss is co-curating his first exhibition this spring: The Black Panther: Celebrating 50+ Years of Black Superheroes on view April 19-August 4, 2018 at King Arts Complex. The exhibition brings together many of Columbus’ most noted black artists working today, as well as, artists from around the country creating art inspired by Black Panther, the first black superhero to appear in Marvel Comics. Aminah Robinson, Mt. Vernon Avenue, South Side of Street, 1930-1957, Page Four, detail, 1992, Paint on cloth with thread and buttons.Gift of the artist. Columbus Museum of Art collection.